I like to do my Christmas Scrapbook Layouts early so that as soon as I get my photos developed, I can put them onto the layouts. This year, I received kits from 3 different companies and put the layouts together over the Thanksgiving break. My shopping my not be done, but my Christmas layouts are ready to receive photos. 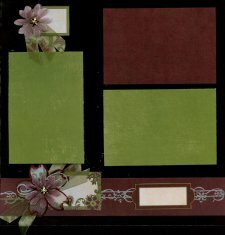 The first set of these layouts is from the Club Scrap Kit called Joyful. The kit came with matching themed papers, a stencil and I purchased a wood mounted rubber stamp to match the collection. Also available were additional unmounted Rubber Stamps to match the images in the papers and the wood mounted Cloisonne Collage Stamp that was designed by Michael Strong. A Dark Green raised print, a Light Green plain, a Translucent raised print and a White raised print make up these papers above. 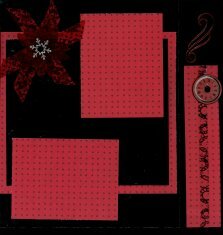 The layout design for these Christmas Scrapbook Layouts was mostly Club Scrap's Assembly Line Scrapbook Layout, but the snow flake stamps were from my stash purchased many years ago. The dark green and white strip of paper along the bottom of the left page was the White Raised print inked with a dark green ink, and then the piece was wiped with a tissue to remove the green ink from the top of the raised printing. 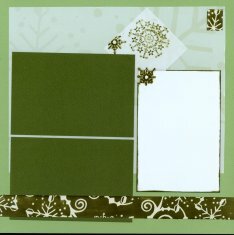 The next set of Christmas Scrapbook Layouts uses A Dark Green plain, a Light Green raised print, a Translucent raised print and a White raised print make up these papers above, along with stamped images of the Cloisonne Collage Stamp on a photo matte on each page. Again, mostly Club Scrap's Assembly Line Scrapbook Layouts. Again, the dark green and white strip of paper along the top and middle of the left page was the White Raised print inked with a dark green ink. 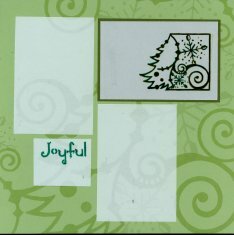 The "Joyful" was from the Stencil that came with the kit, and two large Snowflakes also supplied with the kit appear as embellishments. 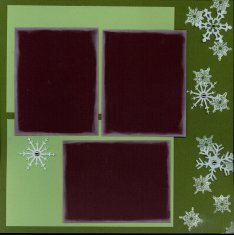 The next set of Christmas Layouts use the Dark Cranberry raised print and plain, a Translucent raised print and a White raised print and White plain. 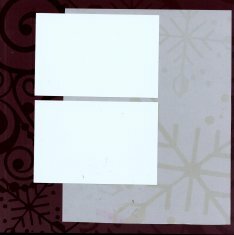 A large portion of the White raised print was inked with Cranberry (it matches much better in real life) and a Cranberry ribbon was added on the right. Again, mostly Club Scrap's Assembly Line Scrapbook Layout with a few extra touches of my own. 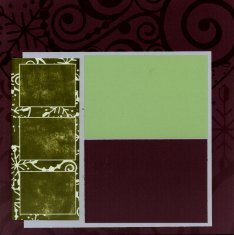 The next set of Christmas Scrapbook Layouts uses A Dark Cranberry raised print and plain, a Light Green raised print, and three pieces of the White raised print inked in dark green as embellishments. 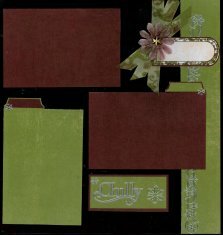 Again, Club Scrap's Assembly Line Scrapbook Layout. One snowflake provided with the kit is attached to the "Rejoice" Embellishment on the right side. 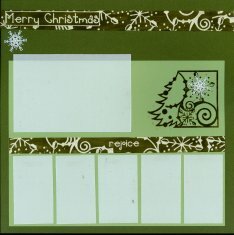 This set of Christmas Scrapbook Layouts use a piece of the Dark Green raised print and Dark and Light Green plain. Mostly Club Scrap's Assembly Line Scrapbook Layouts with a touch or two of my own. 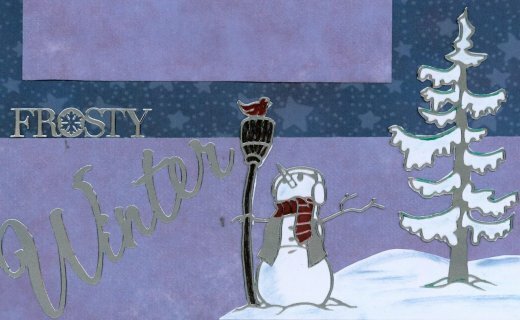 The Cranberry photo mattes were inked in White around the edges, and the white ink was used to stamp a number of snowflake images which are accompanied by more of the plastic snowflakes provided in the kit attached with silver brads through the center. 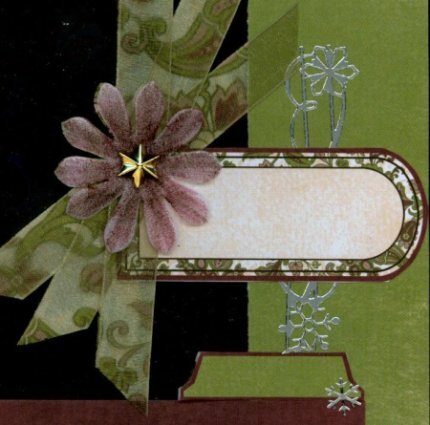 These Monthly Scrapbook Page Kits from Personal Shopper came with Metallic Foil Papers (Card Stock weight), patterned and textured papers, Vellum paper, Brads, Paper Flowers, Clear Plastic Flowers, Ribbons, Coordinating Tags, Snowflake Brads and a large selection of Christmas Dazzles - intricately designed metallic stickers. The November kit also came with a DVD on how to put these page layouts together, but there are also written instructions in the Personal Shopper Newsletter. 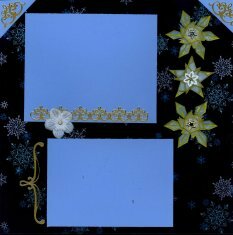 These first two Christmas Scrapbook Layouts above from the Personal Shopper Nov 09 kit were made using a Metallic Card Stock weight background of Blue and Silver Snowflakes from Hot off the Press. Because the Dazzles are very intricate, they makes the page look much harder to do than it really is. 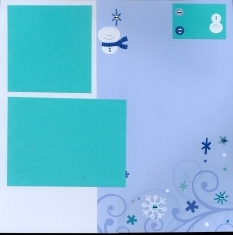 Each layout has 3 snowflakes made from the Snowflake Stencil, also provided with the kit and the DVD shows very clearly how to cut and fold these. 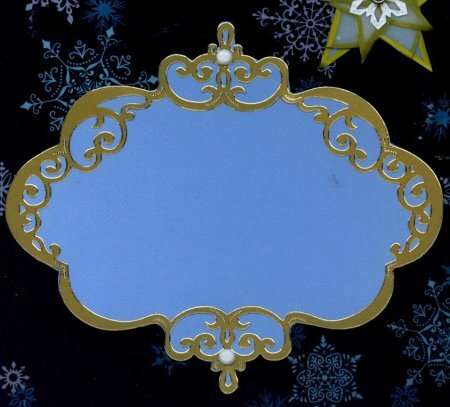 I chose to outline the edges of the snowflakes with a Gold Pen. The journaling box on the right page had the card stock cut out around the edges of the Dazzles. Again, while this looks difficult, the dazzles make it easy to do the cutting and provide a spectacular and delicate look. 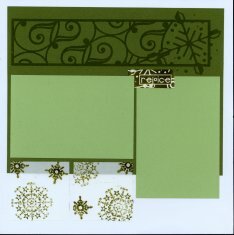 These next Christmas Scrapbook Layouts use Silver Metallic with Large Florals in Red and Green. The scan does not show the pattern in this beautiful paper very well. Using papers and embellishments from the December 09 Personal Shopper Kit, I decided to do my own layout here using the textured green and red mattes and 2 inch strips across the top for one layout and down one side for the other layout. These strips are embellished with Silver Dazzles Borders and Tags. Here are some close ups of two of the embellishments. 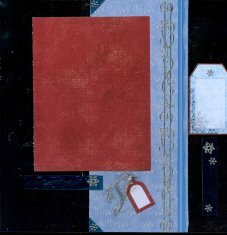 One Floral Embellishment is made from a Plastic Flower inked along the edges in a Red Slick Writer, and an inked Silver Lame Flower and Gold Brad. 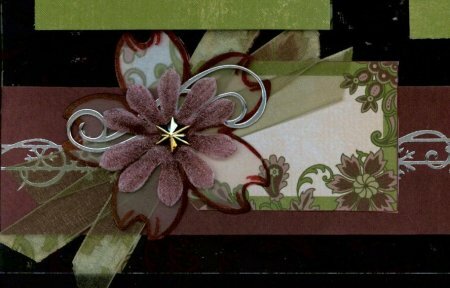 The Plastic Flower also has a Silver Dazzle flourish and is backed by 3 green organza ribbon leaves and attached to a tag that matches the design in the background paper. The other 2 Floral Embellishments are made the same way, but without the Plastic Flower. 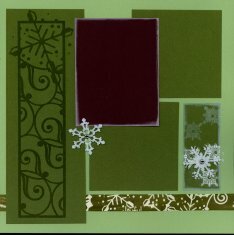 Another Dazzle of the word "Chilly" and a couple of Snowflakes is attached to green paper and matted with the cranberry paper. 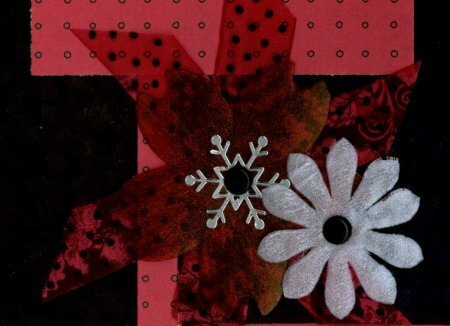 These two Christmas Scrapbook Layouts with are done on Black Metallic Foil paper with silver Floral images. The paper is stunning, but unfortunately does not show well through the scan. These layouts used the Red paper with Dots, and Red Ribbon with Black Dots. A great layout to depict either the count down from Christmas Eve or the count down from New Year's Eve. The black, red and silver goes well with any Party Theme. 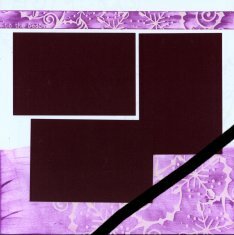 The Clock Image attached with a Black Brad on the side of each layout with the Clock Faces Ribbon. Also shown is a Dazzle flourish that has been inked with the Red Slick Writer to match the other red in the layout. This Floral Embellishment was made with a plastic flower inked red with the Slick Writer. Underneath are leaves cut from 3 stripes of Red Ribbon with Black Dots. On top is a Silver Snowflake Dazzle, with a Black Brad. Next to the Red Flower is a Silver Lame' Flower attached with a Black Brad. 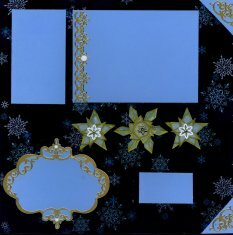 These two Christmas Scrapbook Layouts use a Blue and Silver Foil Metallic background accented with a Coordinated Blue paper with Stars and Dots along with a light Purple textured paper. The matching Tags and Embellishments with Dazzles are the most interesting part of this layout. 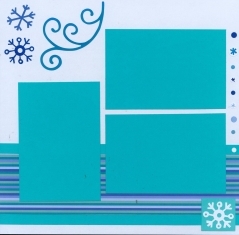 After putting the Dazzle of the Snowman and Snow-woman on white Card Stock, I cut around the outside of the Dazzle. I inked on the background paper with a Slick Writer to color the hats, the scarf and the apron. 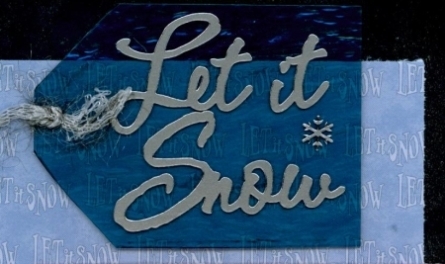 I added a Dazzle snowflake and used Dark Blue Metallic Cream Chalk to accent the snow and the sides of the Snow People. 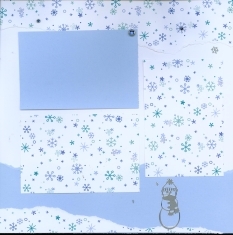 This Dazzle Embellishment of the Snow Man and Tree with Snow were done by placing the Dazzle on the White Card Stock and cutting around the outside of the Embellishment. The Scarf, broom and bird were inked with a Red Slick Writer. The Tree Dazzle has a touch of Green Slick Writer and some Green Metallic Cream Chalk with Blue Chalk on the Snow Drift. 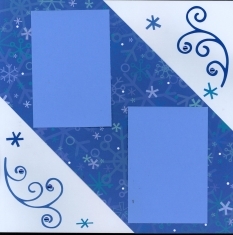 These last two Christmas Scrapbook Layouts from the Personal Shopper Monthly Scrapbook Page Kits are on Silver Metallic Foil, with Blue Snowflake Designs. 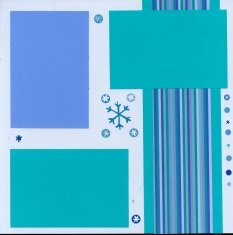 They are accented with Light Blue Paper - Let it Snow, Blue Striped paper and Red Textured paper, plus Dazzles Snowflakes and Border stripes, Flocking on Sticky Tape, and blue plastic called Jolite. Dazzle to Spell out Let it Snow with a couple of Snowflakes on the Blue Jolite. The Jolite is wavy on the reverse side and actually looks like Blue Stained Glass. Strips of the Jolite are cut 1/2 inch wide and embellished with several Dazzle Snowflakes. Silver Dazzle Snowflakes over two round tags. 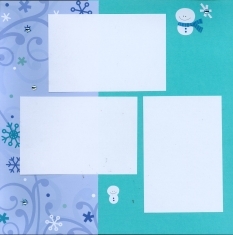 These Christmas Scrapbook Layouts below were ordered from HSN and use the papers and embellishments provided in a kit called Doodlebug Essentials Cold Spell. The kit came with 4 sheets of printed paper, and six sheets of plain paper, Brads, Alphabet Cardstock stickers in White and Blues, an assortment of Sticky Jewels, Mini Rub on letters, and a Winter Blue Satin Ribbon. 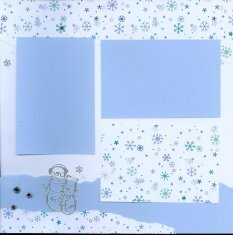 Each layout on white background paper has torn strips of the printed white with blue snow flakes and the solid blue. The remaining portion of the solid blue and blue print were each cut into three photo mattes 4 x 6 inches. 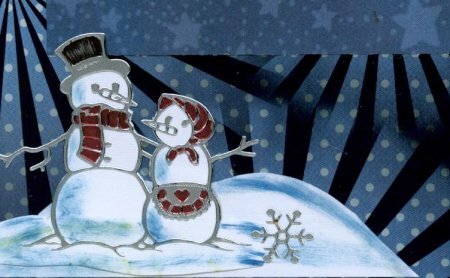 I had a few Silver Christmas Dazzles left over from some Christmas cards, and I used the snowmen on the torn borders along with some silver Dazzle snowflakes and Silver and Blue Brads from my stash. These next two Christmas Scrapbook Layouts used 2 three inch pieces of the striped print edged with 1/2 inch paper ribbon from the teal. The rest of the teal was cut into 5 photo mattes 4 x 6 each and I added one matte from the blue solid. Other embellishments include the die cut stickers in white and blue scattered around both pages. 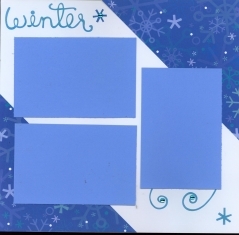 The medium blue card mattes were the remaining 5 mattes from the layout above. 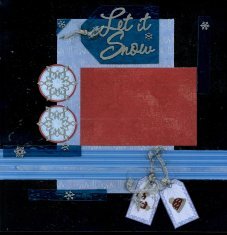 The Embellishments were several of the snowflakes and swirls from the cardstock stickers, Winter Die Cut stickers, and all were enhanced with the sticky rhinestone jewels. These last two layouts used the remaining papers and embellishments. I did need to pull out two more white background papers from my stash to finish these, but there were plenty of embellishments, jewels, and die cuts. I even had the ribbon left over, along with the lettering and the alphabet Rub-Ons that I will use once I get the photos posted and need to do Titles and Journaling. 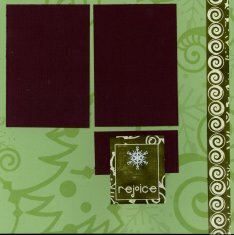 I hope you have enjoyed getting to see these Christmas Scrapbook Kits and what really nice Layouts they have all made. I am looking forward to taking and scrapping the photos that will go on these layouts in the next few weeks. from StoryTellers Club Dec 09. 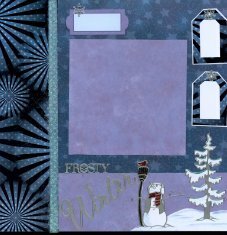 Check out our Christmas Card Making Ideas. 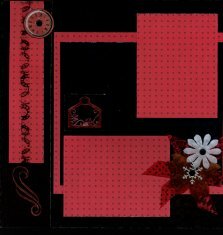 Other Monthly Scrapbook Page Kits.